While everone else seems to be jumping on the smart home band wagon, we pride ourselves on being experts in the industry with over 36 years of experience. Liberty Bell Smart Home is a Pinnacle and Premier dealer for both Control4 and Alarm.com smart home automation control systems. Smart home automation is the convergence of technology and convenience, allowing the digital devices that you use every day—TVs, audio equipment, lights, security panels, thermostats, and so on—to work together. By allowing everything in the house to work together, with the ability to control it all from one easy-to-use interface—whether it's a touch screen, remote control, keypad, or even your smartphone—your home suddenly and automatically becomes more comfortable, convenient and secure. What happens if you forget to close your garage? Not a problem with smart home automation. You can access all of the devices in your home—including that neglected garage door—no matter where you are. Simply log in to your home from a computer, smartphone or tablet and close the garage door instantly. 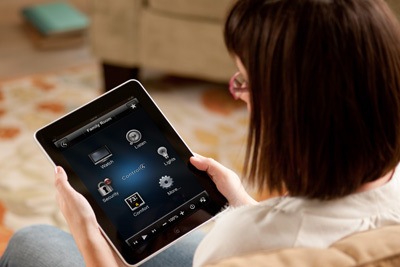 Turn your smartphone, tablet or laptop into the ultimate remote for your smart home automation system.